Find the lowest prices for Spanish Language Courses in Granada! Are you looking for Spanish language schools in Granada or a Spanish summer school in Granada? 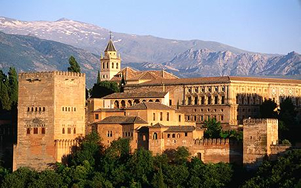 How about study Spanish in Granada or language courses for adults in Granada? Whatever type of Spanish course you are looking for, Languagebookings.com will help you find it—and at the lowest possible price! Browse over many Spanish schools in many locations in Granada until you find the Spanish course and school that is right for you. We make it easy to find discount prices at the most popular schools in Granada and we provide detailed school information, photos, videos and students reviews for a great variety of Spanish schools in Granada. Choose Languagebookings.com for all your courses reservations, and see why more and more students are choosing us to study Spanish language in Granada! Learning Spanish through Spanish schools Granada can provide you with everything you need to learn about the language and the country itself. Granada is a province that is located at the foot of the Sierra Nevada Mountains. Granada sits on a vast area of fertile land which explains the abundance that the people are enjoying there. Food and culture is both rich here and when you decide to study Spanish in Spanish school Granada, you will experience more of the province’s exciting and enjoyable way of life. The people in Granada are known for their hospitality and humor. Studying Spanish in Spanish schools Granada will give you the ability to understand their language and learn their sense of humor. Those who have gone to study in Spanish schools Granada have gained a lot of friends due to the welcoming and nice disposition of the people that lives in this province. Also, if you love warm and sunny climate, then Spanish schools Granada is where you should be. The climate in this province is generally dry and warm but at the night, the temperature drops slightly. Spring and autumn is considered as the best time to come here and study at Spanish schools Granada. Why Study at Spanish Schools Granada? When most students flock to the country’s famous cities, studying at Spanish schools Granada will give you an exclusive experience of learning the language and seeing Spain in a different viewpoint. Staying in Granada will provide you with the opportunity to experience everything that this place is famous for. Also Spanish schools Granada are considered as competitive and as good as their counterparts in the city so you do not have to worry about the quality of education. Granada is also home to the most attractive and picturesque churches and museums. This place is rich in their historical heritage which is shown in their architecture. While you are studying Spanish schools Granada, you can visit these places. Alhambra is a great castle that is located in Granada. This is considered by travel enthusiasts as one of the Ten Wonders of the World. This castle is composed of beautiful gardens, mini palaces and forts. It has also been the place of Arab Sultans who took control over this province some time in history. Study in Spanish schools Granada and be one of the 8,500 people who witness the awesomeness of this place everyday. A place where you can witness a Spanish woman dance the Flamenco live is in Sacramonte. The gypsies occupy this part of the province. The Rocio, which is a popular Flamenco gypsy cave, is also located here. As a student studying in one of Spanish schools Granada, you can go this place and buy a ticket for a Flamenco performance in one of the hotels where you will be fetched by a minibus. Granada is one of the most visited places in Spain. This country has a lot more to offer than just a Spanish language course. Studying in Spanish schools Granada will not only teach you how to speak Spanish, it will also teach you how to appreciate and understand the country’s culture.